Donita K. Paul retired early from teaching school, but soon got bored! The result: a determination to start a new career. Now she is an award-winning novelist writing Christian Romance and Fantasy. 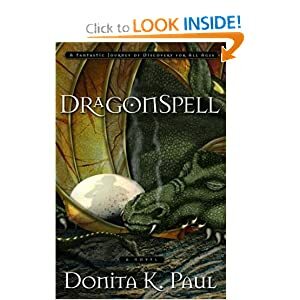 Her website is http://www.donitakpaul.com/author/bio.html. I have always been a fan of fantasy and quests. I enjoyed the book from the first page. The book was full of memorable characters in a world that was full of adventure, mystery and magic. The main character Kale was easy to relate to and had a wonderful personality. I loved all of the wizards and the dragons and was easy to read. The book has a Christian message that is not pushy or preachy and I recommend the book to everyone who loves dragons and wizards. Disclosure: I received this book for free from WaterBrook Publishing Group for this review. All opinions expressed are 100% mine. Would you say that this book is appropriate for a tween or a teenager?